The permanent GPS station was established at Pulkovo Observatory on 22 April 2002 in cooperation with NAVGEOCOM Co. The antenna is mounted on a steel tube connected to the brick wall of the building. Initially, Trimble 4000SSE receiver and TRM33429.20+GP antenna without radome were installed at the station. On 25 June 2004, TRM33429.20+GP antenna was replaced with TRM41249.00 antenna without radome. On 1 September 2006, Trimble 4000SSE receiver was replaced with Trimble 4000SSI receiver. 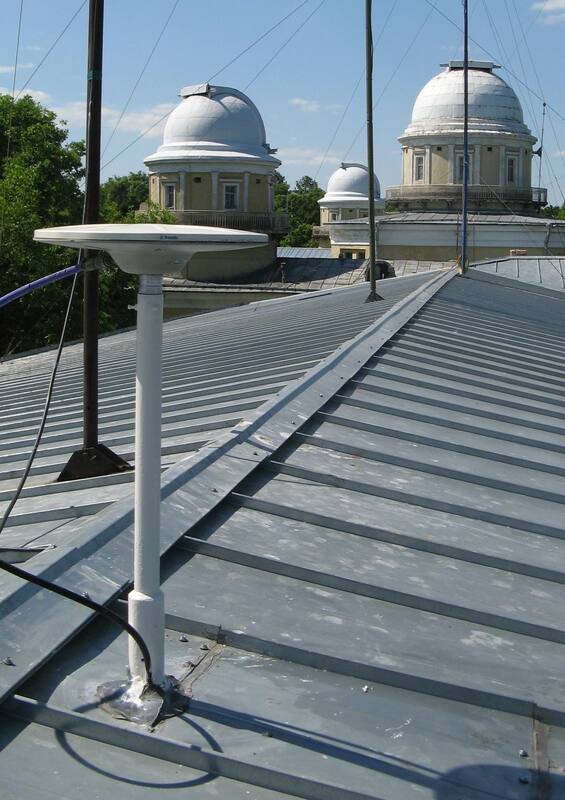 In May 2008, Pulkovo GNSS station became an EPN station PULK (DOMES 12305M001). Both hourly and daily data are delivered to EPN data centers. On 21 July 2010, ECCOSORB VHP microwave absorber was installed beneath the antenna. Removed on 29 December 2012. On 13 May 2014, Trimble 4000SSI receiver was replaced with TPS NETG3 GPS+GLONASS receiver (connected to the same antenna). On 7 June 2017, TRM41249.00 antenna was replaced with TRM57971.00 antenna without radome. On 10 May 2018, TPS NETG3 receiver was replaced with Leica GR10 receiver (connected to the same antenna). On 5 March 2019 Leica GR10 receiver was replaced with Trimble NETR9 receiver (connected to the same antenna). Data are processed using the GIPSY-OASIS v. 6.4 software developed at the Jet Propulsion Laboratory. Daily PULK station position is computed in the Precise Point Positioning (PPP) mode using orbits, clocks, EOP, and antenna absolute phase center corrections provided by the JPL ftp service. Ocean loading is computed using data obtained from the OSO ocean tide loading provider. GOT4.8 model is currently used. Ocean loading pole tide model is invoked. Loading values are corrected for the Earth's center of mass motion due to ocean tides. VMF1GRID model is used for computation of tropospheric delay. 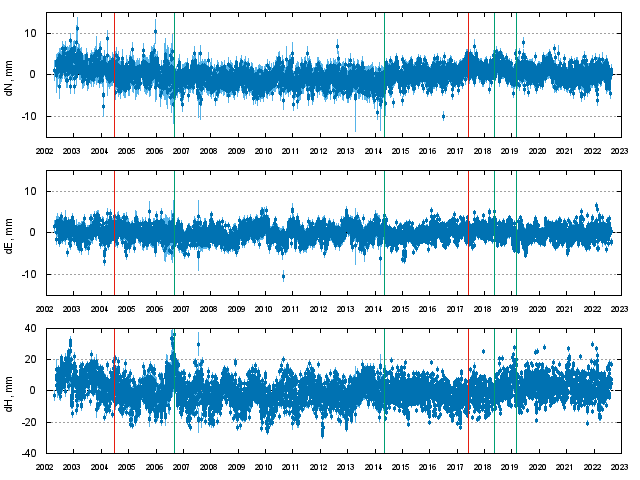 PULK station position variations (daily estimates after removing the above velocities) are depicted in the plot. Atmospheric pressure loading is included in the time series. Vertical error bars show 1-sigma uncertainty in the position estimates. Green lines show dates of receiver changes, and red lines show dates of antenna changes. Average uncertainty for the whole period of observations is σN = 1.5 mm, σE = 0.9 mm, σH = 2.0 mm. Average uncertainty for the last month is σN = 1.0 mm, σE = 0.6 mm, σH = 1.4 mm.